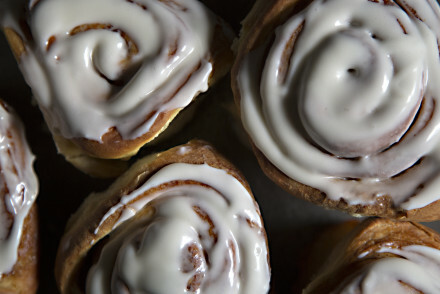 America’s love affair with cinnamon rolls is alive and well. Cinnamon rolls, sticky buns, coffee cakes…I’ve featured recipes for all of these by request. But lately I’ve had more queries, well, “pleas” is probably more accurate–for a good, old-fashioned-tasting, gluten free version. Lots of test batches and not-quite-there results finally prompted me to ask friend and pastry chef Tory O’Haire for help. This is delicious result! Combining potato flakes with almond meal, rice flour and tapioca starch the dough bakes up soft and moist, with rich buttery flavor and a nice contrasting crunch from the walnuts in the cinnamon-sugar filling. Plus? There are these addictive, crackly butter-toffee-like shards that bake up around the edges from the filling that oozes out. As with other gluten-free recipes, this dough is delicate so you’ll have to handle with care. I’ve had good results chilling the shaped cake, or rolls and then bringing them just up to temperature before baking. And for more cinnamon pleasure? 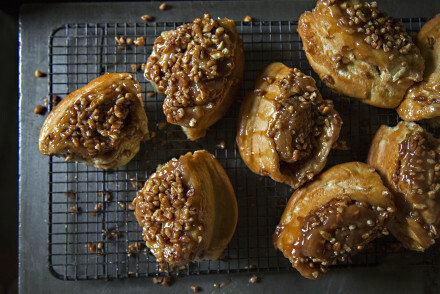 Try our recipe for Giant Cinnamon Rolls and our Caramel Pecan Sticky Buns. Tender dough made with potato, brown rice flour and almond meal, with a nice contrasting crunch from the cinnamon-sugar walnut filling, and addictive butter-toffee like shards that bake up around the edges from the filling that oozes out. Make filling: Combine dry ingredients and then pour in the hot, melted butter, stirring until smooth. Make dough: Combine the dry ingredients for the dough in the work bowl of a stand mixer. Set aside. When the yeast mixture is foamy, add the egg coconut oil and vanilla to the yeast mixture. With the stand mixer running at a very low speed, pour the liquid ingredients into the dry-mixture in a steady stream. Increase speed to medium and beat for 5 minutes, stopping to scrape the bowl as needed. If making the coffee cake: Gather the dough into a soft ball and set in a large oiled bowl in a warm place to proof for 15 minutes. If making cinnamon rolls: Divide the dough into two portions and proof. Roll out until 1/2 inch thick. (be careful not to roll too thin.) Spread filling over the dough, leaving a 1-inch border along the far edge. Using the parchment paper to help, gently lift and roll the dough into a spiral. Slightly flatten this to make a five inch wide oblong coffee cake. Tuck ends under. Wrap and refrigerate for 1/2 hour. 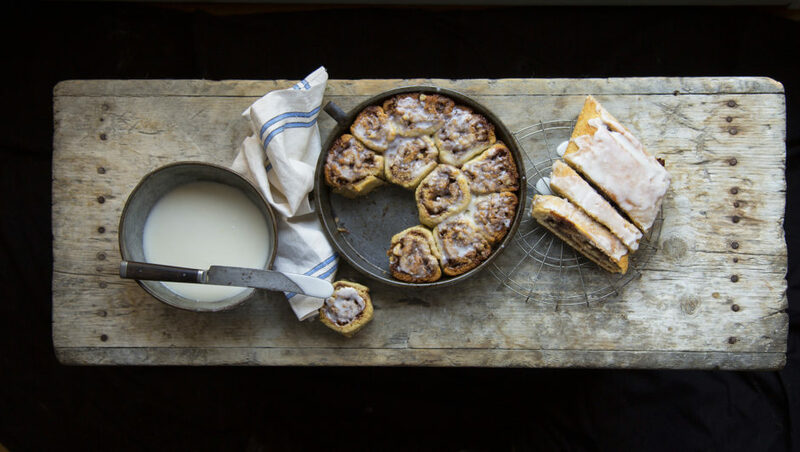 If making cinnamon rolls: do this process twice, using each portion of dough and rolling up into a "round" log rather than the flattened one used for the cake. Remove chilled cake OR cinnamon roll logs from refrigerator. If making cake, place entire loaf on parchment-lined half-sheet pan, seam-side down. If making cinnamon rolls, butter two cake pans. Slice each cinnamon-roll log into 12 rolls and place in each pan. Set aside to proof for 12 minutes. While rolls OR cake are proofing, preheat oven to 350 egrees. Place rolls OR cake in center of oven and bake for 25 minutes until puffed and golden. Make glaze. Drizzle glaze over warm rolls. Adding potato to sweet roll dough makes for a very tender crumb. This gluten-free cinnamon roll recipe has potato in the dough and potato starch in the cinnamon-sugar-butter filling. Can the recipe use potato rather than potato flakes?? I have not tried this recipe with a potato cooked and mashed etc…however, I do have a recipe for a beautiful Portuguese Sweet Bread that uses a mashed potato and some of the water you boil the potato in…so I think you might be able to do this. However, I have not tested this Gluten-Free Cinnamon Roll recipe using potato rather than potato flakes. Let me know if you conduct any experiments!